"Saudi Woman Beheaded for Witchcraft" read media headlines around the world on December 13, 2011. News reports described how a 60-year-old woman was executed after being convicted of practicing witchcraft on the basis of such evidence as books on witchcraft, veils, and glass bottles full of an "unknown liquid used for sorcery." Yet the majority of news accounts implied that the woman was a victim of persecution by the Saudi government; as one of Amnesty International's directors declared: "The charge of sorcery has often been used in Saudi Arabia to punish people, generally after unfair trials, for exercising their right to freedom of speech or religion." 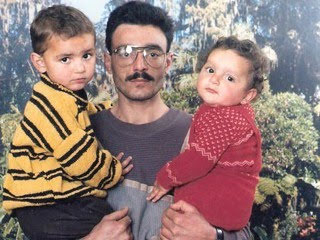 Ali Sabat, seen here with two of his children, was the host of a Lebanese satellite television program that provided psychic advice for Arab callers. He was sentenced to death by a Saudi court while on pilgrimage there "because he had practiced 'sorcery' publicly … before millions of viewers." As a result of international pressure, he received a last minute reprieve with his sentence reduced to fifteen years in prison. No Western reporters seemed to consider that the victim was actually practicing witchcraft, or why witchcraft is considered by the desert kingdom a crime punishable by death. In the West, there is a societal need to place this seemingly inexplicable incident in an understandable context such as the violation of human rights rather than examining this Islamic tradition that includes the belief, practice, and prohibition of magic. In fact, the practice of what can be termed Islamic magic is prevalent throughout the Muslim world, manifested in the theological concept of jinn, inhabiting the entire sphere of the Muslim occult. Furthermore, magical beliefs can constitute an existential and political threat to Islamic religious leaders, provoking severe punishments and strict prohibitions of any practice not sanctioned by their authority. Conversely, political leaders, including Iran's president Mahmoud Ahmadinejad, Taliban leader Mullah Omar, and Pakistani president Asif Ali Zardari, have employed magical beliefs to advance their political agendas. Belief in witchcraft, sorcery, magic, ghosts, and demons is widespread and pervasive throughout the Muslim world. Magical beliefs are expressed in the wearing of amulets, consulting spiritual healers and fortunetellers, shrine worship, exorcisms, animal sacrifice, and numerous customs and rituals that provide protection from the evil eye, demons, and jinn. Fears associated with these beliefs range from hauntings and curses to illness, poverty, and everyday misfortunes. Supernatural practices that are intended to bring good fortune, health, increased status, honor, and power also abound. Magical beliefs are not relegated to rural or poverty-stricken areas. On the contrary, they are observable in every segment of society regardless of socioeconomic status. One of the more popular customs is fortunetelling, which is different from the Western practice, which is usually relegated to the status of a carnival act and specific to predicting the future. Generally, the practice of fortunetelling in the Middle East focuses more on spiritual protection and family counseling than prediction and prophecy. In addition to reading cards, dice, palms, and coffee grounds, activities include selling amulets to ward off evil spirits and providing advice for marital problems. In Afghanistan, fortunetellers operate out of small shops or outside of mosques and shrines across the country but are rarely consulted to portend the future; most often their clients are women or the elderly seeking guidance for problems affecting their families. In Iran, fortunetelling has become increasingly popular, and people of all ages turn to fortunetellers in search of happiness and security. In Pakistan, fortunetelling and belief in astrology is so widespread that practitioners appear on morning television shows. All magical practices are denounced as un-Islamic by clerics. Although they condemn fortunetelling, the practice is not punished as severely as witchcraft and sorcery. This is likely due to the fact that fortunetelling is viewed as using magic to acquire unseen knowledge while sorcery is viewed as intentionally practicing malevolent or black magic. Recently, in Afghanistan, Gaza, Bahrain, and Saudi Arabia, stricter laws, arrests, and executions have resulted in efforts to deter magical practices. In January 2008, Afghan religious elders banned dozens of traditional fortunetellers in Mazar-i-Sharif from the area near the Hazrat Ali shrine. In 2010, the Islamist group Hamas, ruling the Gaza Strip, conducted a campaign against witchcraft in the area, arresting 150 women, who were then forced to sign confessions and statements renouncing the practice. According to Hamas "the activities of these women represent a real social danger, also because they risk 'breaking up families,' causing divorce and frittering away of money. Sometimes their activities also have criminal repercussions." In addition to the arrests, Hamas placed large anti-witchcraft posters at mosques, universities, and government offices warning women against magical practices and providing information to Gaza residents wishing to accuse their neighbors of the crime. In August 2010, the campaign escalated to violence when a 62-year-old woman known as a traditional healer was murdered in front of her house by unidentified men after she was accused by her neighbors of practicing witchcraft. In January 2012, Hamas declared the profession of fortunetelling illegal and "forced 142 fortune-tellers to sign written statements averring that they would stop trying to predict the future and sell trinkets that are supposed to offer personal protection." In Egypt, Khalil Fadel, a prominent Egyptian psychiatrist, claimed that many Egyptians, including the highly-educated, were spending large amounts of money on sorcery and superstition and warned that growing superstition among Egyptians was threatening the country's national security, dependent as it was on the mental health of the nation. Under current law, people alleged to be sorcerers can be arrested in Egypt for fraud, but now that the Muslim Brotherhood has come to power and is drafting new legislation, it is conceivable that soon witchcraft could be designated a crime of apostasy, punishable by death. In April 2009, Bahrain passed strict sorcery laws after x-rays revealed packages containing hair, nails, and blood were being shipped there; witchcraft and sorcery are now criminal offences that can result in fines or prison, followed by deportation. Neighboring Saudi Arabia enforces the most severe penalties for designated magical crimes. The threat of black magic is taken so seriously there that, in May 2009, an anti-witchcraft unit was created to combat it, along with traditional healing and fortunetelling, and placed under the control of the Committee for the Promotion of Virtue and the Prevention of Vice (CPV), which employs Saudi Arabia's religious police, the mutaween. "On the CPV's website, a hotline encourages citizens across the kingdom to report cases of sorcery to local officials for immediate treatment." Nine specialized centers were set up in large cities to deal with practitioners of black magic. A large segment of the "witches" arrested by the CPV were Africans and Indonesians as black magic is often attributed to foreign workers, particularly maids. In September 2011, hundreds of Saudi women complained when the Shura Council (an advisory body) granted permission for Moroccan women, internationally reputed by Muslims as masters of black magic, to work as maids in Saudi households. The wives claimed it was "tantamount to allowing the use of black magic in their homes to steal their husbands … the issue was not lacking trust in their husbands, but their men were powerless to ward off spells." Foreign domestic workers in the kingdom are accused of sorcery regularly either due to their traditional practices or because Saudi men, facing charges of sexual harassment, want to discredit their accusers. Nor is prosecution for witchcraft in Saudi Arabia restricted to women. In 2010, Ali Sabat, host of a Lebanese satellite television program that provided psychic advice for callers from around the Arab world, was imprisoned while on the hajj pilgrimage. In a closed court hearing with no representation, he was sentenced to death "because he had practiced 'sorcery' publicly for several years before millions of viewers." As a result of international pressure, he received a last minute reprieve, and his sentence was eventually reduced to fifteen years in prison. Others had no such luck. There have been several executions for similar crimes: In September 2011, a Sudanese man was beheaded for the crime of witchcraft and sorcery, having been caught in a sting operation set in motion by the religious police and then convicted in a closed trial. In April 2011, thirty officers from the CPV attended a three-day training workshop in the Eastern Province to investigate black magic crimes. The anti-witchcraft unit's specialized training apparently also involved learning Qur'anic healing rituals to destroy the effects of black magic. There are detailed Islamic treatises on neutralizing black magic that include entire exorcism rites and purification rituals for the destruction of amulets and other magical items. Thus the irony results that neutralizing the effects of spells also constitutes magical practices, albeit legalized ones. In brief, there are sorcerers, fortunetellers, and traditional healers throughout the Muslim world; many are in violation of interpretations of the Shari'a (Islamic law), and in some countries, that is punishable by death. European witch hunts ended when the scientific revolution and the Enlightenment brought empirical reason to the fore, and rationality eventually replaced the West's superstitious world-views. The Islamic view of sorcery and witchcraft is significantly different. In contemporary Islamic witch hunts, there is an accepted, long-established, theologically-sanctioned supernatural tradition. Although science was cultivated in Muslim lands during Islam's Golden Age, witch hunts never ceased because the Enlightenment's rationalist ideologies did not replace the Islamic magical world-view. Rather, Islamic witch hunts have evolved into a combination of primal ritual and modern technology where videos of exorcisms and beheadings are available on the Internet. To fully comprehend contemporary witch hunts and the prevalence of magical beliefs in the Muslim world, it is necessary to understand the concept of jinn. Jinn provide Islamic explanations for evil, illness, health, wealth, and position in society as well as all mundane and inexplicable phenomena in between. The word jinn (also written as jinnee, djinn, djinni, genii or genie) is derived from the Arabic root j-n-n meaning to hide or be hidden, similar to the Latin origins of the word "occult" (hidden). In the West, occult practices are marginalized and relegated to pagan traditions or the mystical aspects of religious traditions. In Islam, however, jinn are an integral part of Islamic theology. According to the Qur'an, God created humans from clay, angels from light, and jinn from smokeless fire: "Although belief in jinn is not one of the five pillars of Islam, one can't be Muslim if he/she doesn't have faith in their existence. … Indeed, the Qur'anic message itself is addressed to both humans and jinn, considered the only two intelligent species on earth." While frequently described as angels and demons, jinn are actually a third category—complex, intermediary beings who, similar to humans, have free will and can embrace goodness or evil. Like humans, they are required to worship God and will be judged on the Day of Judgment according to their deeds. Evil jinn are referred to as shayatin, or devils, and Iblis (Satan) is their chief. They can take the form of humans or animals with many of the fears associated with Islamic purification rites expressed in the symbolic attributes of the jinn. For example, in Islam, dogs, urine, feces, and blood are intrinsically impure, and jinn are known to shape-shift to dogs, accept impure animal sacrifice, and dwell in bathrooms, graveyards, and other unclean places. Muslims believe that evil jinn are spiritual entities that can enter and possess people and exercise supernatural influence over them. Women are considered to be more vulnerable to jinn because they are thought to be weaker in their faith and impure several days of the month. While jinn have been relegated to fantasy characters in the West, to countless believing Muslims, there is no doubt that they exist. An August 2009 Gallup poll, for example, found that 89 percent of Pakistanis respondents surveyed, believed in jinn. Witches, sorcerers, and fortunetellers are all believed to be under the guidance of jinn and are sometimes referred to as "jinn catchers." Jinn are intrinsically intertwined with the practice of both licit Qur'anic magic and illicit black magic (sihir). Black magic is considered to be worked by those who have learned to summon evil jinn to serve them while Qur'anic magic invokes the guidance of God to exorcise the demons. Even spiritual healers with good intentions who do not employ Qur'anic healing methods can be designated as witches and sorcerers: In Saudi Arabia, only qualified individuals, usually natives designated by the religious authorities, are allowed to practice Qur'anic treatment methods; most of those arrested and beheaded for sorcery and witchcraft tend to be foreigners regardless of whether or not they were practicing Qur'anic medicine. Despite regulations, an entire industry of professional exorcists who perform Qur'anic healing has arisen to meet demand throughout the Middle East and among Western Muslims with exorcists openly advertising on the Internet, using Facebook and Twitter, and posting thousands of videos on YouTube demonstrating healing techniques and publicizing actual exorcisms. Qur'anicHealers.com, a division of Spiritual Superpower Inc., for example, has a Paypal account, contact information for Qur'anic healers in twelve countries and a post office box in Artesia, California. Clerics, police, and politicians carefully negotiate the political, religious, legal, moral, and ethical issues that arise from dealing with this world of spirits with each country having its own laws to regulate various practices. For example, although exorcists are not prohibited in Gaza, Hamas considers most of them con artists, claiming to have exposed thirty cases of fraud in 2010: "We caught some suspects red-handed … using magic to separate married couples … It was all an act of deception and exploitation. Some people handed over fortunes, and one woman gave all her jewelry to one of these exorcists." Abusive, quasi-medical practices have also been committed in the name of Qur'anic magic. Despite the fact that there are hospitals with psychiatric sections in Afghanistan, a common practice there is to chain the mentally ill to shrines for forty days to ritually exorcise the jinn "possessing" them. Patients are fed a strict diet of bread and black pepper, do not have a change of clothing, and sleep on the ground. Those who do not survive the treatments are buried in earthen mounds around the shrine. While doctors in Muslim lands recognize physical and mental illnesses, some are inclined to attribute inexplicable cases to possession. And although there are mullahs and religious scholars reportedly against these practices, the custom continues. There is no doubt that clerics believe in the powers of jinn; they would no more question the existence of jinn than they would the Qur'an. Jinn can represent an existential and political threat to religious leaders. Religious clerics condemn or actively ban illicit spiritual healing not because of the atrocities that have been committed, or because people are being defrauded, or even out of a conviction to save people's souls from evil but out of fear that jinn exist and can be induced to subvert their authority. Sheikh Abu Khaled, a Palestinian exorcist, said the number of possessed Muslims has more than tripled: "I suspect that Jewish magicians send jinns to us here in Gaza. In fact, most of my patients are possessed with Jewish jinns." Some leaders allude to possessing supernatural powers in order to self-aggrandize but this can also backfire. Iranian president Mahmoud Ahmadinejad told followers in 2005 that he "was surrounded by a halo of light during a speech to the U.N. General Assembly, in which the foreign leaders in the hall were transfixed, unable to blink for a half hour." But in May 2011, Ahmadinejad's supernatural "powers" resulted in the arrests of two dozen of his aides, charged by opposing religious clerics with practicing black magic and invoking jinn. While most Western reporters scoffed at the story of imprisoned exorcists, The Wall Street Journal interviewed a renowned Iranian sorcerer, Seyed Sadigh, who claimed that dozens of Iran's top government officials consult him on matters of national security and that he used jinn to infiltrate Israeli and U.S. intelligence agencies: "Mr. Sadigh says he doesn't waste jinn powers on trivial matters such as love and money. Rather, he contacts jinn who can help out on matters of national security and the regime's political stability. His regular roll call includes jinn who work for … the Mossad, and for the U.S. Central Intelligence Agency." It would appear that the accusations of sorcery were the result of a power struggle between the president and the country's supreme leader, Ayatollah Ali Khamene'i, making this both an actual and political witch hunt. The primary target of the arrests was Ahmadinejad's chief of staff Esfandiar Rahim Mashaei whose "alternative Messianic version of Islam … includes aspects of the occult and a more limited role for clerics." Not surprisingly, Sadigh reinforced this notion, declaring, "I have information that Ahmadinejad is under a spell, and they are now trying to cast one on Supreme Leader Ayatollah Seyed Ali Khamene'i to obey them blindly." Sadigh the sorcerer negotiates the politics of magic like a pro, changing allegiances to align himself with whoever seems to be on top and selling his services to him. Perhaps the real power behind the Iranian government resides with the jinn catchers. Mullah Omar, the Pashtun founder of the Taliban, is widely perceived as magically protected. Laying claim to the Afghan tradition of charismatic mullahs with supernatural powers, Omar adopted the same strategy, removing a cloak, believed by many Afghans to having been worn by the prophet Muhammad, from a shrine in Kandahar and wearing it openly. Since legend decreed that the chest holding the cloak could only be opened when touched by a true leader of the Muslims, wearing it gave him the status of an Afghan hero endowed with extraordinary mystical powers. When Kabul fell to his forces, his supernatural status was confirmed. Knowing that the Pashtun emphasize dreams as a form of revelation, Omar cultivated the idea that God spoke to him through his dreams and claimed that he based his most crucial policy decisions on them. Whether to appease a superstitious people or out of sincerely-held belief, Pakistani president Asif Ali Zardari sacrifices a black goat nearly every day to ward off the evil eye and provide protection from black magic. He, along with Ahmadinejad and Mullah Omar, understands that knowledge of local customs, jinn, and magical practices has significant political value. A superstitious population presents numerous opportunities to communicate fear, apprehension, or awe and to exert influence. Knowledge of local myths, customs, and magical beliefs can present unique opportunities for diplomacy as well as warfare, but Westerners do not know how to deal with belief in supernatural phenomena, continually applying a rational, scientific approach to cultures that engage in magical thinking and refusing to acknowledge the political significance of these beliefs. Currently, U.S. policymakers cannot even publicly acknowledge that acts of terrorism are based on Islamist religious ideologies, much less give credence to jinn. U.S. leaders tend to attribute the root causes of violence to secular, social, and economic factors such as poverty, illness, illiteracy, and hunger. This has resulted in a strategy to win the hearts and minds of the people by providing food, shelter, education, and medicine. These operations have consistently failed because Islamic religious and political leaders understand that their people primarily view the root cause of their difficulties as a spiritual problem. Instead of freedom, they foster faith. The Islamic strategy is to win souls by providing supernatural protection, via God or jinn. Hearts and minds will then follow. Dawn Perlmutter is director and founder of Symbol & Ritual Intelligence and a leading expert on religious terrorism and ritualistic crimes. She trains and advises law enforcement and defense agency personnel. The New York Times, Dec. 12, 2011; ABC News, Dec. 13, 2011; CNN, Dec. 13, 2011; al-Jazeera TV (Doha), Dec. 13, 2011. Amnesty International, Dec. 12, 2011; al-Jazeera TV (Doha), Dec. 13, 2011; The Telegraph (London), Dec. 13, 2011. Chowrangi blog, May 18, 2011.
 International Mediterranean News Service (ANSAmed), Jan. 15, 2011. Ma'an News Agency (Bethlehem), Aug. 19, 2010. Arutz Sheva (Beit El and Petah Tikva), Jan. 3, 2012. The Huffington Post (New York), Sept. 6, 2009. Gulf Daily News (Manama, Bahrain), Apr. 1, 2009; Muslim Media Network, May 13, 2010. The Jerusalem Post, July 20, 2011. Arab News (Riyadh), Apr. 4, 2011. Morocco Board News (Washington, D.C.), Oct. 1, 2011; The Jerusalem Post, Oct. 22, 2011. The Jerusalem Post, Oct. 22, 2011. Ibid., July 20, 2011; Uri Friedman, "How Do You Prove Someone's a Witch in Saudi Arabia?" Foreign Policy, Dec. 13, 2011. Emirates 24/7 (Dubai), Apr. 23, 2011. The New York Times, Apr. 2, 2010. All videos accessed Jan. 4, 2013, YouTube: "Islamic Exorcism," June 7, 2006, "Exorcism in Islam," July 29, 2007, "Ruyati Binti Sapubi—An Indonesian Maid in Saudi Arabia Beheaded," June 18, 2011, "Man beheaded in carpark as per Muslim Shariah law." Amira El-Zein, Islam, Arabs and the Intelligent World of the Jinn (Syracuse: Syracuse University Press, 2009), p. x.
 Reinhold Loeffler, Islam in Practice: Religious Beliefs in a Persian Village (Albany: State University of New York Press, 1988), p. 46. Sam Shamoun, "Qur'an Incoherence and Contradiction: Is Satan an Angel or a Jinn?" Answering-islam.org, accessed Dec. 28, 2012; "Jinn According to Quran and Sunnah," Muttaqun.com, accessed Dec. 28, 2012. Gerda Sengers, Women and Demons: Cult Healing in Islamic Egypt (Leiden: Brill, 2003), p. 163. "Pakistanis' Belief in Super Natural Beings," Gilani Poll-Gallup Pakistan, Islamabad, Aug. 31, 2009. Qur'anicHealers.com , accessed Dec. 28, 2012. Celia E. Rothenberg, Spirits of Palestine: Gender, Society and Stories of the Jinn (Lanham, Md. : Lexington Books, 2004), pp. 77-8. Robert S. Robins and Jerrold M. Post, Political Paranoia: The Psychopolitics of Hatred (New Haven: Yale University Press, 1997), p. 56. ABC News, May 9, 2011. The Wall Street Journal, June 10, 2011. ABC News, May 9, 2011; ibid., June 10, 2011. Thomas H. Johnson and M. Chris Mason, "Understanding the Taliban and Insurgency in Afghanistan," Orbis, Winter 2007. The Guardian (London), Jan. 27, 2010; ABC News, Jan. 29, 2010. Related Topics: Islam | Dawn Perlmutter | Spring 2013 MEQ receive the latest by email: subscribe to the free mef mailing list This text may be reposted or forwarded so long as it is presented as an integral whole with complete and accurate information provided about its author, date, place of publication, and original URL.